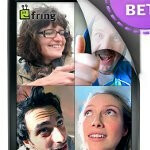 Continuing to promote the seriousness and usefulness of its services over the competition, Fring is now looking to get some feedback on its new Group Video Calls feature that’s in limited beta as we speak. Available to a limited set of users using the app on Android smartphones and the iPhone, the new feature basically allows you to enjoy free Group Video calls with up to 4 friends simultaneously. Essentially, when all users connect, you’ll be able to see all four faces of the people included in the video chat directly on your handset. Definitely nice if you want the presence of everyone in front of you, but then again, some people might find it rather difficult in getting some face time. Currently, Fring has used up their entire beta slots for the iPhone, however, there are still some spots left for people using Android. You’d better apply now if you want to be able to check out this new feature and provide them some solid feedback about the new service.